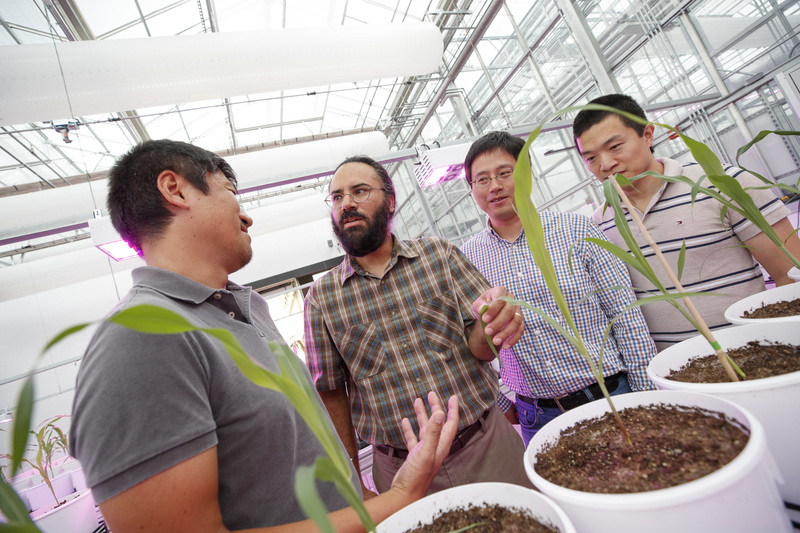 Harkamal Walia (second from left) discusses an experimental plan for the grant at the High Throughput Phenotyping facility at the Greenhouse Innovation Center on Nebraska Innovation Campus. From left is Toshihiro Obata, Hongfeng Yu and Qi Zhang. Not pictured are researchers Chi Zhang and Gota Morota. Harkamal Walia, associate professor of agronomy and horticulture at the University of Nebraska-Lincoln, has been awarded a $5.78 million National Science Foundation grant to explore the affects of high nighttime temperatures on wheat and rice. “We’re hoping to gain a better physiological and genetic understanding of the heat stress responses," Walia said. "This knowledge will drive the development of crops that are more resilient to higher temperatures in terms of yield and quality." Rice is one of the most important crops for global food security. According to Walia, the crop provides 60 to 65 percent of the daily caloric intake for people who live on less than $1 per day. Wheat is the most widely grown crop in the world and an important commodity for Nebraska. Together, wheat and rice account for more than 50 percent of the world's calorie consumption. “Genetic improvement of crops for tolerance to increased heat, drought and salinity stress are an important component of an integrated approach toward global food security,” said Walia, who will work closely with industry partners to translate discoveries into useful genetic and phenotypic markers. “Nebraska is perfectly poised to lead research of this kind because we’ve invested in the Greenhouse Innovation Center at Nebraska Innovation Campus."